Guinea (khu-pia̍t-ia̍h) lia̍t chhut miâ chhin-chhiūⁿ ê bûn-chiuⁿ. 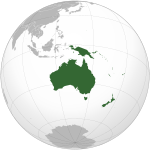 Papua New Guinea ê só͘-chāi. 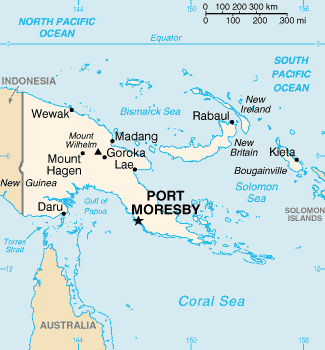 Papua New Guinea To̍k-li̍p-kok (Eng-gí: Independent State of Papua New Guinea; Tok Pisin: Independen Stet bilong Papua Niugini), New Guinea tang-pêng ê kok-ka. ↑ Somare, Michael (6 December 2004). "Stable Government, Investment Initiatives, and Economic Growth". Keynote address to the 8th Papua New Guinea Mining and Petroleum Conference. goân-loē-iông tī 2006-06-28 hőng khó͘-pih. 9 August 2007 khòaⁿ--ê. ↑ "Never more to rise". The National (February 6, 2006). 19 January 2005 khòaⁿ--ê. ↑ 4.0 4.1 4.2 4.3 "Papua New Guinea". International Monetary Fund. 20 April 2012 khòaⁿ--ê.
Chit ia̍h siāng bóe tī 2018-nî 7-goe̍h 27-ji̍t (Pài-gō͘), 16:51 ū pian-chi̍p--koè.